The other week, Joshua and Daniel and I watched ‘The Wedding of River Song’. It was as bad as I remember it. The moment when River tells the Doctor that the universe loves him is possibly the worst bit of dialogue Moffat’s committed to paper. “Those reports of the sun spots and the solar flares,” she tells him. “They’re wrong. There aren’t any. It’s not the sun, it’s you. The sky is full of a million, million voices saying yes, of course we’ll help. You’ve touched so many lives, saved so many people.” I cried. And not in a good way. When it got to the big reveal, Joshua said “I really don’t understand any of this”. None of this actually makes any sense at all, because what it means is that the raggedy ‘Soothsayer’ Doctor that exists in the parallel timeline is the Teselecta Doctor, who appears to have grown a mullet and facial hair, organic growth which I would have thought was beyond the capabilities of the robot. Mind you, we’re talking about a robot that can only pull off the vaguest, most stilted impression of a human being when it’s impersonating Amy (honestly, it’s like watching Mr T trying to act) but which, by the time we’ve reached the last episode, is able to emulate a fully functioning Time Lord, right down to the regenerative sparkle. Presumably all the Doctor had to do was wave his screwdriver a bit to ‘upgrade the system’, but honestly, it’s Flash, bang, wallop, spectacle with no substance underneath. “So that’s the Doctor?” inquired Josh. There was a pause. “I think,” said Joshua after a moment, “that a better title for this episode would have been ‘Not the shrinking Fez, Doctor!”. Which only makes sense if you’ve seen this. There’s another thing. 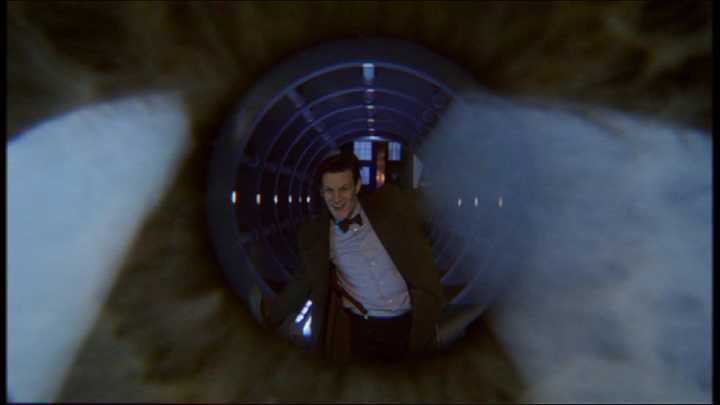 If the Doctor’s hiding inside his own eyeball, he can’t be doing the talking, unless he’s wearing a radio mic, which he is not. Which means that whole scene between the two of them is utterly fake. It’s not a heartfelt confrontation between the Doctor and the woman who loves him, it’s Alex Kingston talking to a robot who’s probably reading from a script. I mentioned our session to Gareth, but referred to it as ‘The Weeding of River Song’. “That was, of course, deliberate”. He said. “I’m just not sure what it means”. Neither am I. I turned it over in my head for a few minutes. You could change it to ‘Weeding of the Song River’, which sort of works, because it sounds like a Chinese marine biology project. 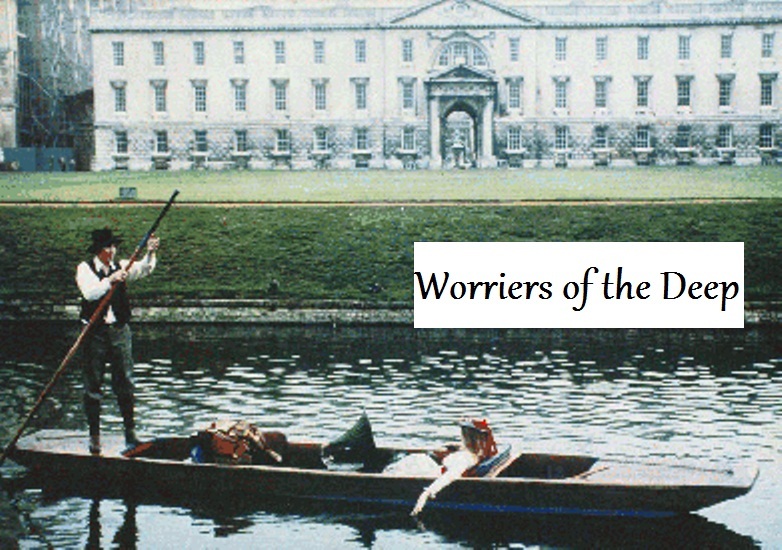 But Gareth said “No, it just needs punctuation: the ‘weeding of the river’ song. Sort of half Tolkien, half Kenneth Williams. Anyway, we now know what Tom Baker was up to in Shada.